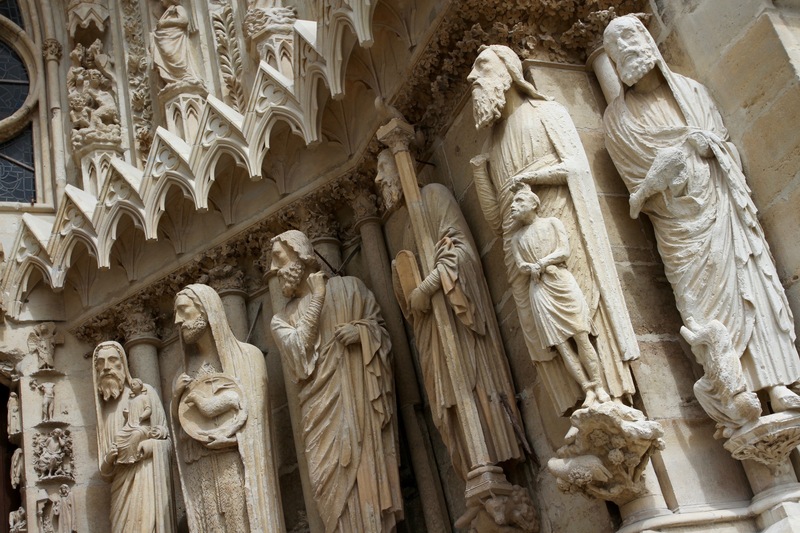 There is one moment, in the long history of the Cathedral de Notre-Dame de Reims, that stands above the many momentous events witnessed by this ancient building. It was here in 1429, in the presence of Joan of Arc, that Charles VII was crowned King of France. It was a highly symbolic moment, coming only a short time after the raising of the English siege of Orleans. Charles would go on to defeat the English and his rule became one of the most important in French history. Nearly a thousand years earlier, the tradition of crowning French Kings in Reims was begun by Clovis I, King of the Franks, who was Baptised in Reims on Christmas Day 498 AD. This is often considered to be the day France was born. 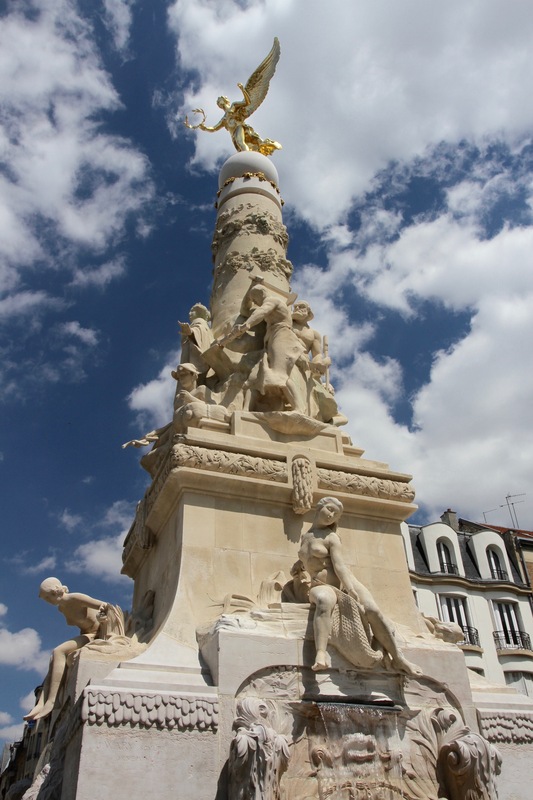 Between Clovis’ coronation and the overthrow of Napoleon III in 1870, thirty-three French monarchs were crowned in Reims. 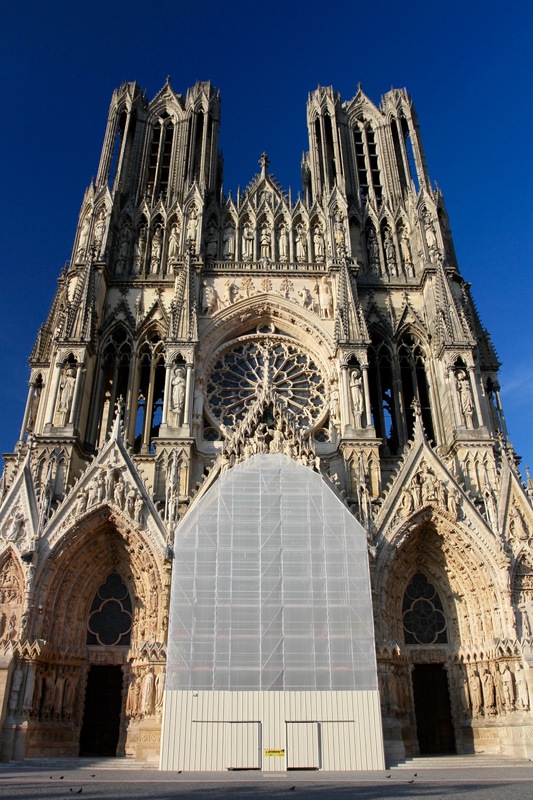 This royal history has had a profound impact on the city, and the grandeur of Notre-Dame de Reims reflects its importance. 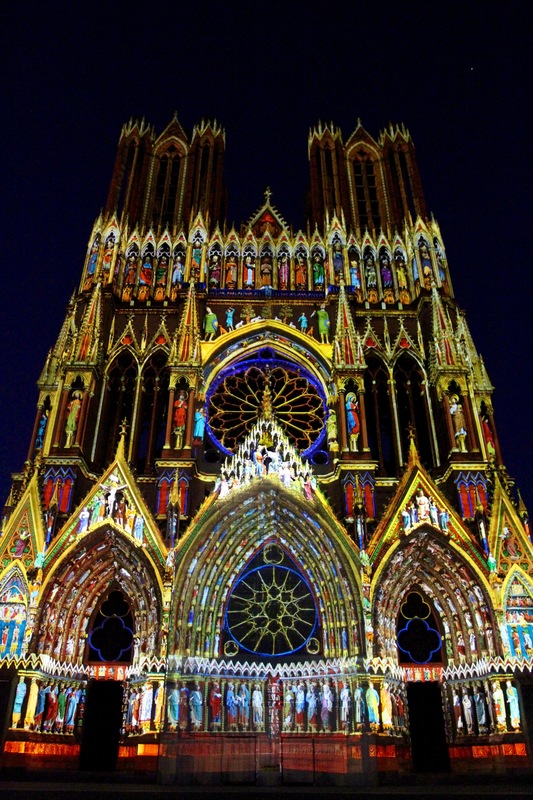 Our first introduction to Notre-Dame de Reims – one of the finest cathedrals in France, possibly Europe – was seeing it illuminated at night as we drove around trying to find where we were staying. We arrived around 10pm after a long journey, and headed to the square outside the cathedral for food and a glass of champagne. 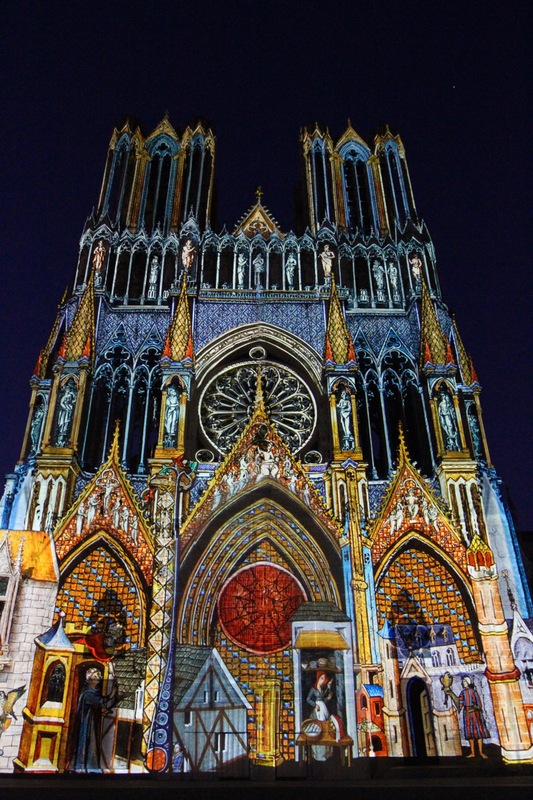 As we reached the square the nightly son et lumière show, projected onto the cathedral facade, started. 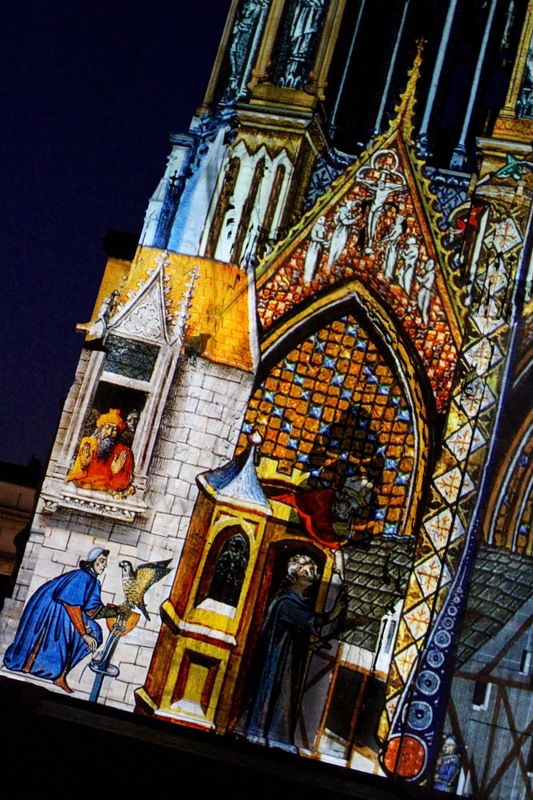 The projections were accompanied by music to narrate the history of the construction of the cathedral. It was pretty fantastic. It was also a reminder that facades of medieval European cathedrals were often painted bright colours. Even if they were a fraction as colourful as the son et lumière, they must have made a big impression on people. 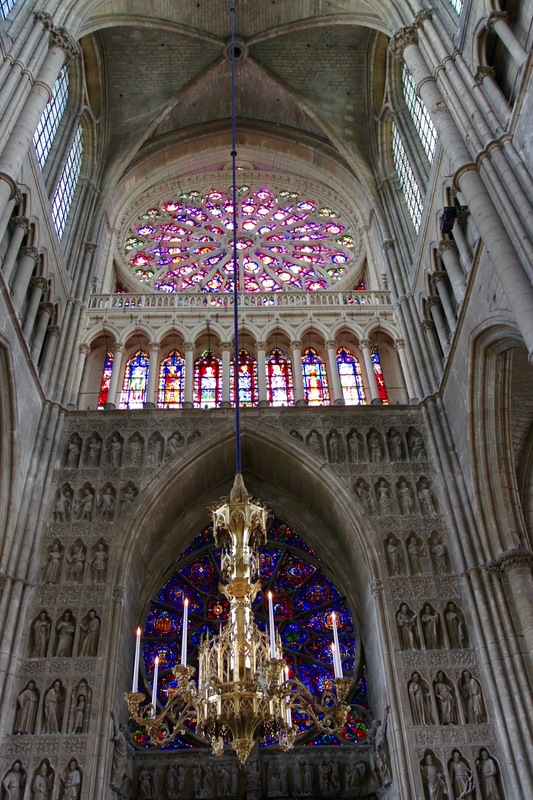 Add to this the glorious stained glass windows, and medieval cathedrals were “carnivals of colour and light”. We visited Reims at the weekend and I was expecting there to be hoards of tourists and day-trippers from Paris, but the town was remarkably non-touristy. Even inside the cathedral the crowds were light, and it was possible to fully enjoy the glories of the immense rose windows in peaceful surroundings. The rose windows are the most spectacular, but the other stained glass windows that illuminate the interior are equally as fabulous. Severe damage during the First World War means most of the windows are modern replacements, as is much of the masonry on the exterior. The cathedral received around three hundred direct hits from German artillery during the war, and in 1919 when reconstruction began the cathedral was virtually destroyed. Restoration has continued, more-or-less, to the present day, and scaffolding was on the exterior of the building when we visited. Next door to the cathedral is the equally magnificent UNESCO World Heritage Site, the Palais du Tau. 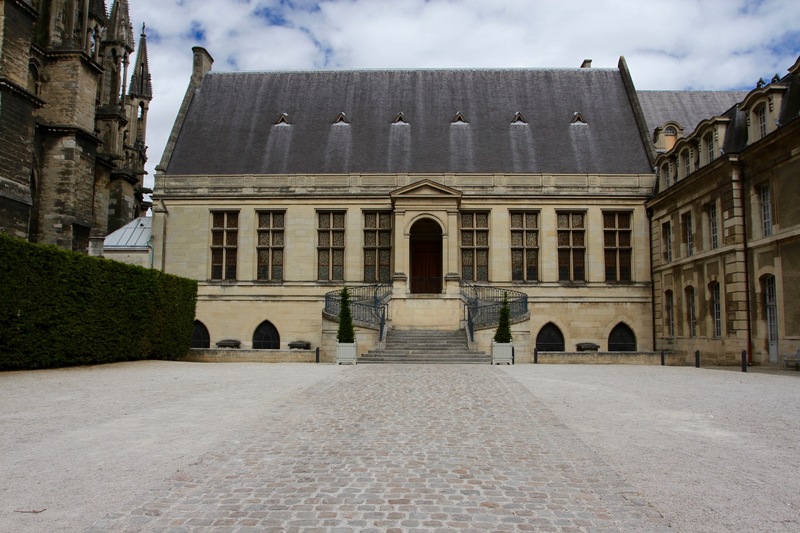 Formerly the home of the Bishops of Reims, this is also where French monarchs stayed and later celebrated during a coronation. 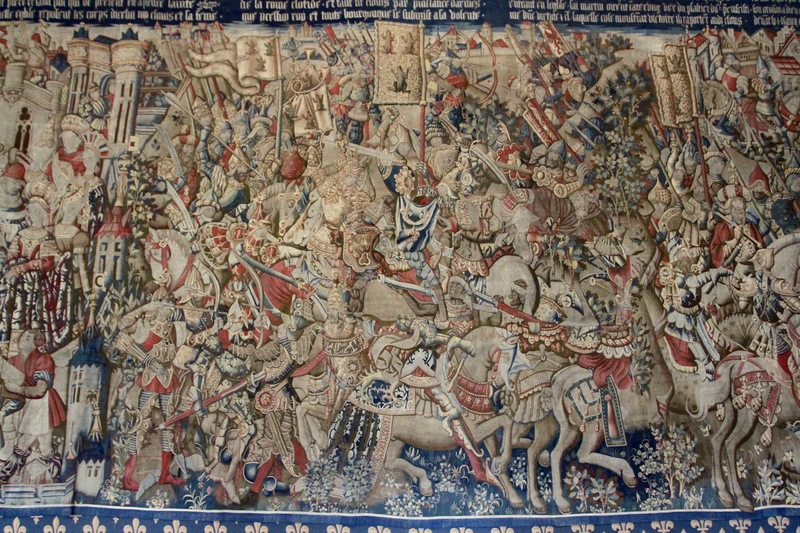 The Great Hall, where the royal banquet was held, is decorated with 15th-century tapestries telling the story of King Clovis. 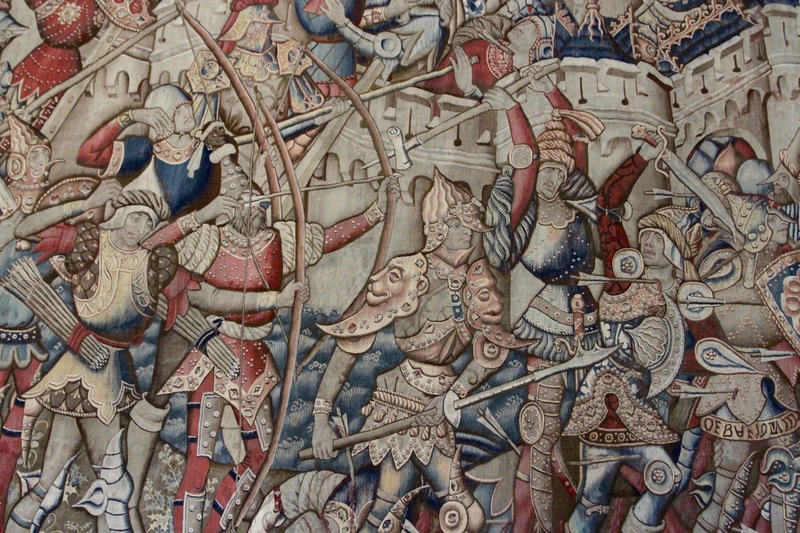 The detail of the tapestries is exquisite. The Palace of Tau dates from as early as the 5th century, but has gone through multiple incarnations and expansions. The current building dates from 1690. It was rebuilt in 1210 after a fire and, of course, it didn’t escape the ravages of the First World War. Rebuilding after the war took until 1972 to complete. It would be fair to say it has seen some history, good and bad. 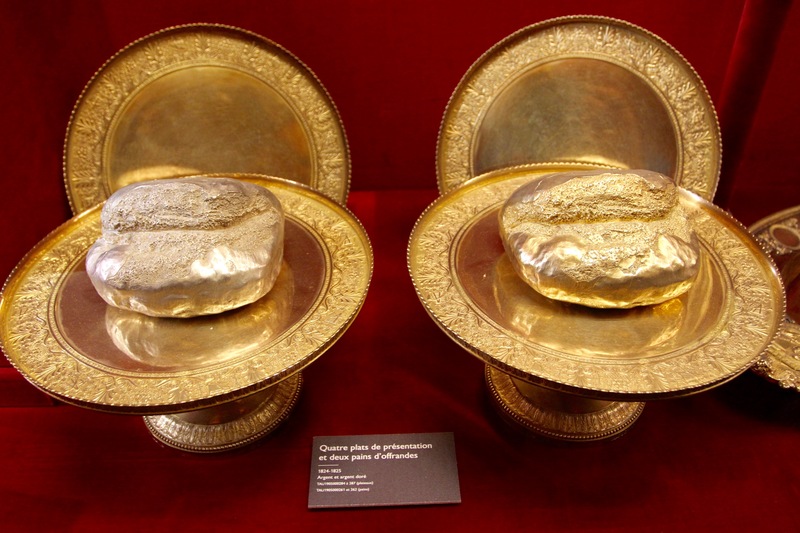 Now a museum, it’s home to many ecclesiastical treasures, including golden loaves of bread and a talisman that belonged to Charlemange, and is alleged to contain splinters of the cross Jesus was crucified on. The talisman was buried with Charlemange at Aix-la-Chapelle, in 814 AD, and then removed from his tomb 200 years later. 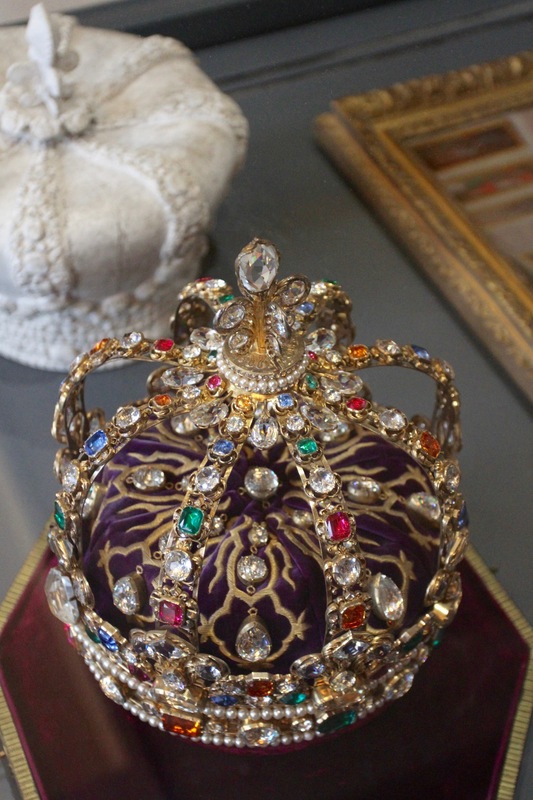 The Empress “not tonight” Josephine wore it at her coronation alongside Napoleon in 1804. It might just be me, but that seems a little gruesome. 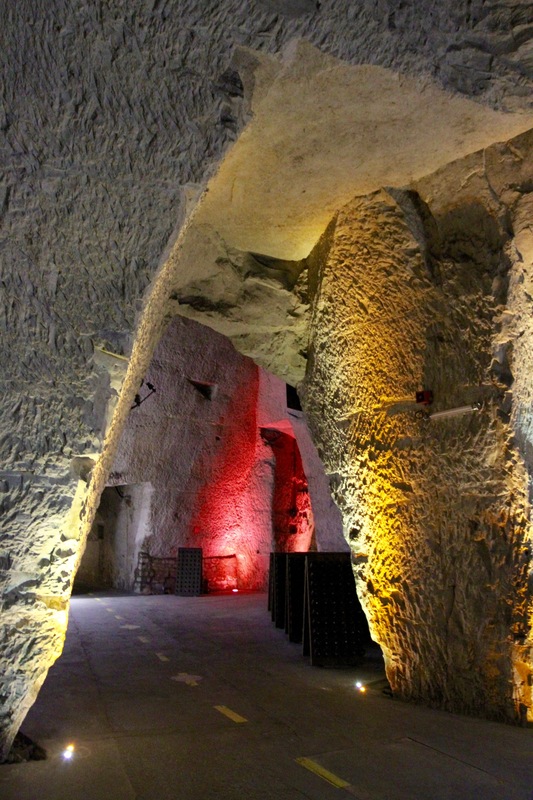 No visit to Reims would be complete without descending into the subterranean world of the city’s champagne cellars. The headquarters of some of the world’s most famous champagne brands are scattered around the city, most are a walk or taxi journey from the centre. 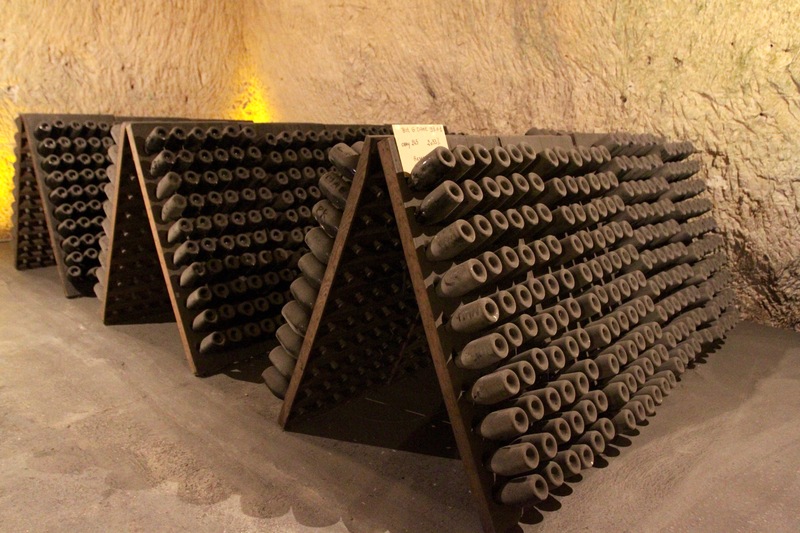 Reims doesn’t have the grandeur of Epernay’s Avenue de Champagne, lined with magnificent champagne houses, but a tour of the Reims’ champagne cellars is easy to arrange and even easier to enjoy. 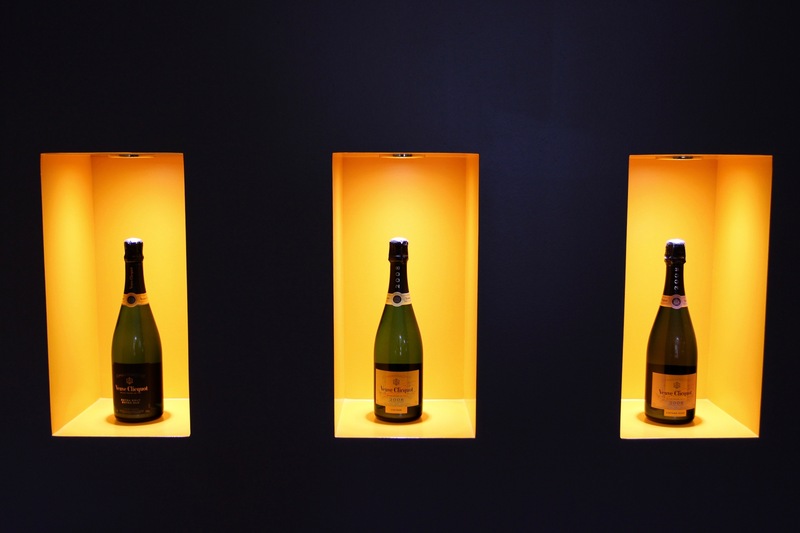 We visited one of world’s best known champagne producers, with a history to match its famous yellow labels: Veuve Clicquot. 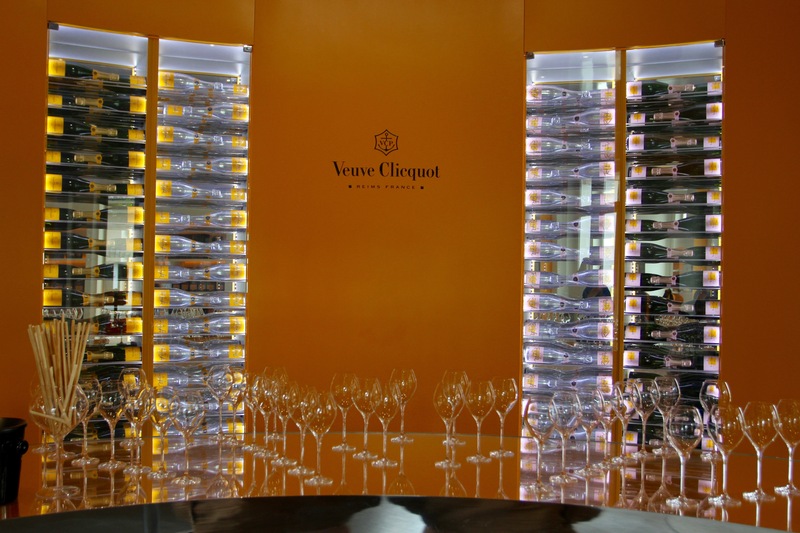 The story of Veuve Clicquot is the story of a visionary businesswoman and champagne innovator, Madame Clicquot, La Grande Dame de la Champagne. 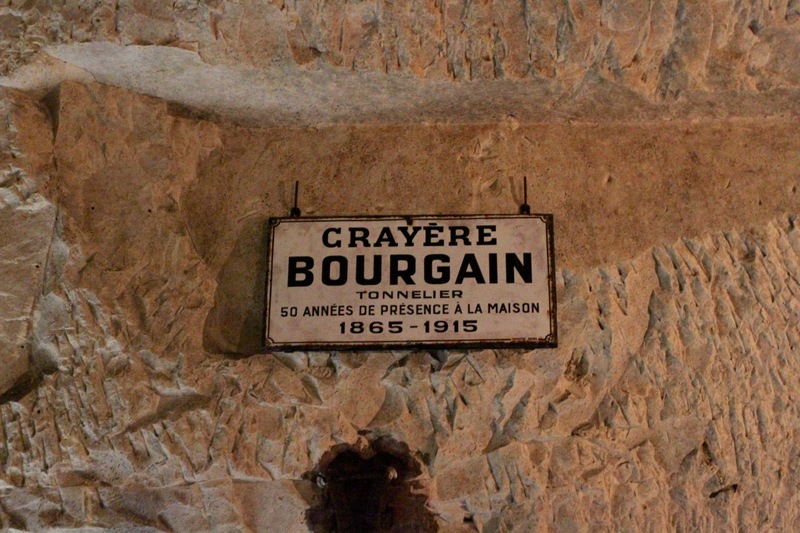 We opted for the “Footsteps of Madame Clicquot” cellar tour (a pricey €50), which gave an insight into the life of the woman behind the empire, and ended with a tasting that included a glass of La Grand Dame champagne. Born in 1777 into an aristocratic family, at the young age of 27 Madame Clicquot took control of the company in 1805 following the death of her husband. This itself was pioneering, women just didn’t run companies in the early 19th century. She was known to be uncompromising about the quality of her champagne and prepared to take risks to sell it all over the world – the very first shipment of Veuve Clicquot went to Venice. 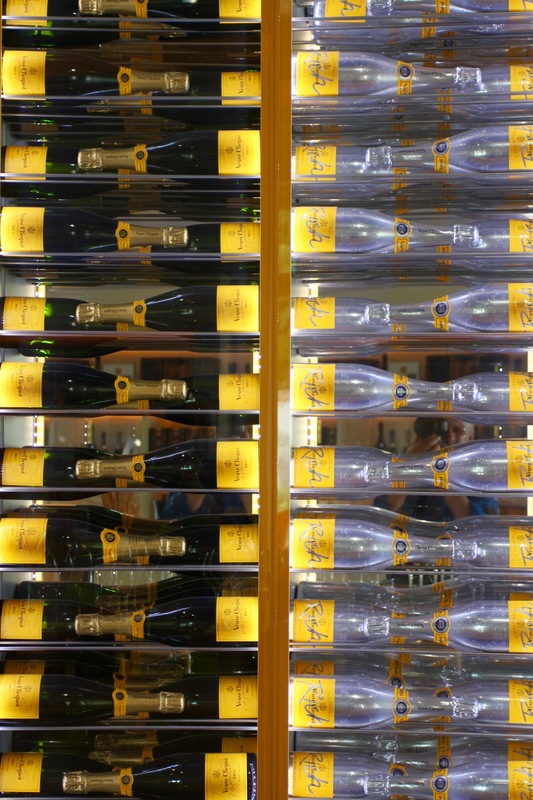 Veuve Clicquot has a long tradition of exporting champagne, and 80 percent of today’s production is drunk outside France. 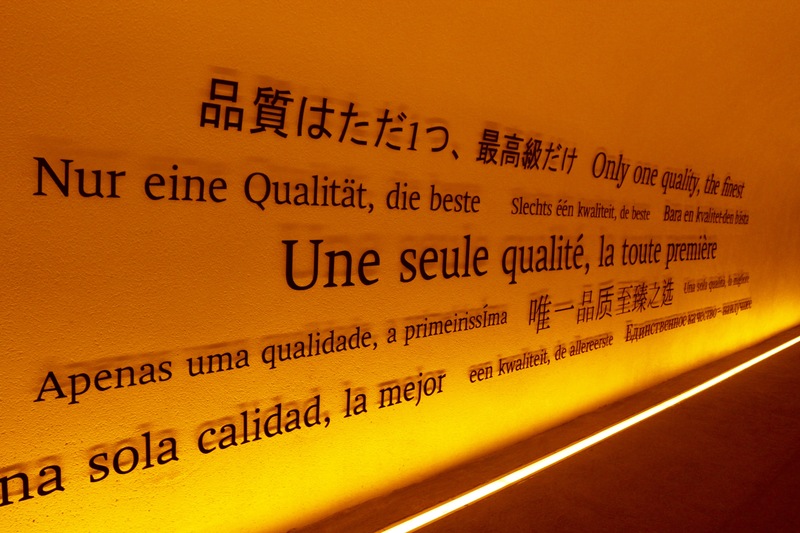 Madame Clicquot was a pioneer in this respect, establishing the brand with the royal courts of Europe, including the Imperial Russian court in 1814. This was during the Napoleonic Wars, when France was at war with Russia, and she deliberately broke a trade blockade between the two countries to ship 10,550 bottles to the enemy. Not very patriotic, but very lucrative. 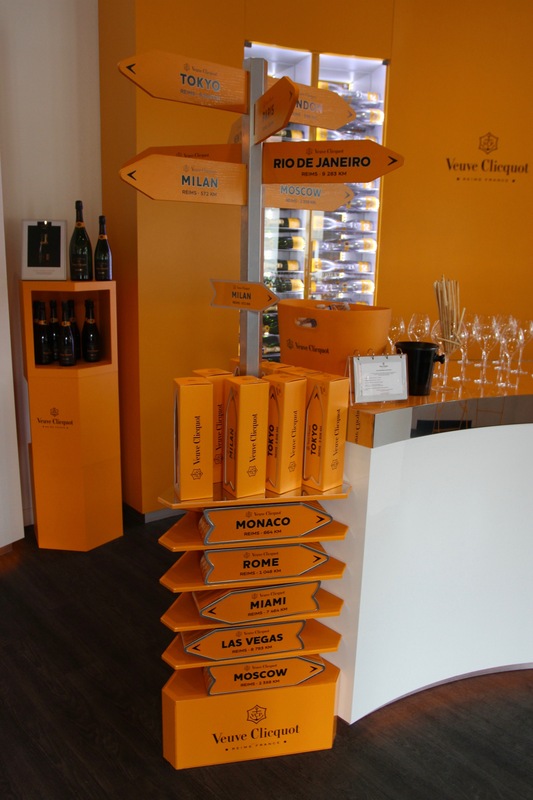 The year 1811 is famous in Veuve Clicquot history: this was the year of the Cuvée de la Comète. After a string of bad growing years, the 1811 grape harvest was exceptional. This was attributed to the fact that the Flaugergues Comet was visible throughout the growing season. 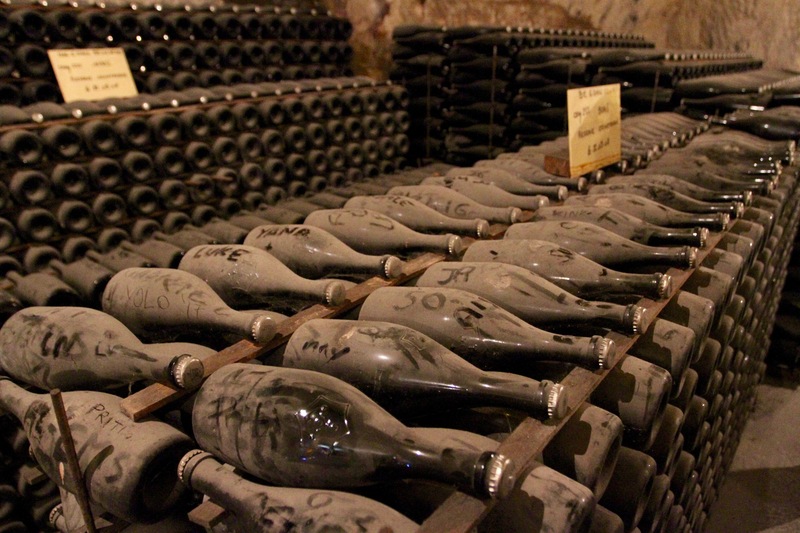 For many, the comet presaged the end of the world, but for many wine producers it transformed their fortunes. 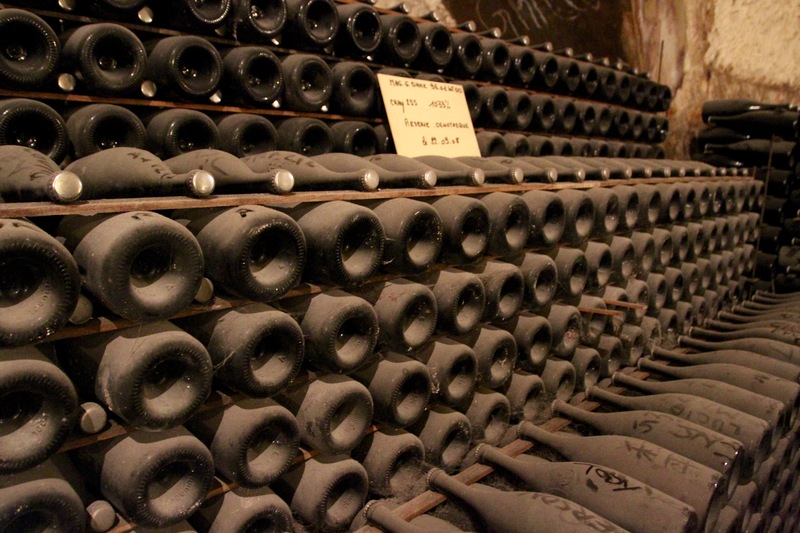 Comet vintages had great value, and it was this wine that Madame Clicquot sent to Russia. These days, a comet symbol can be found on all their labels. We arrived at the visitor centre without a reservation, but got onto the next tour. 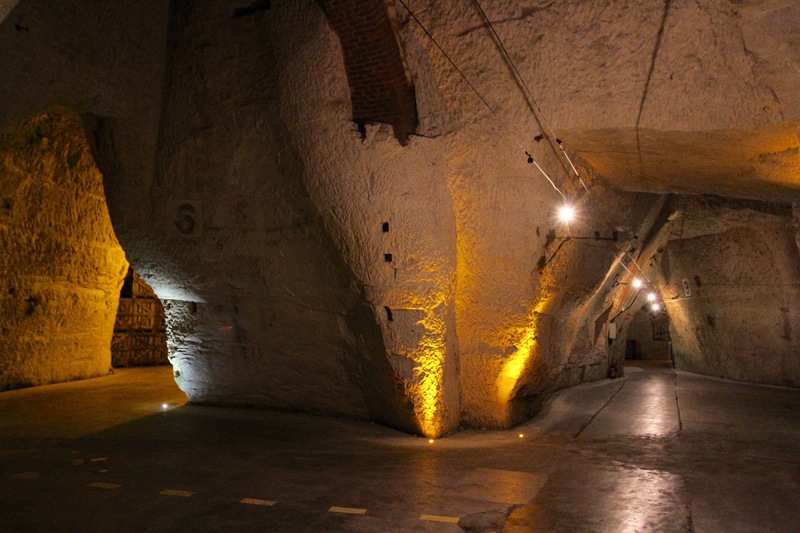 As we descended into the vast network of tunnels that honeycomb subterranean Reims, the temperature dropped and our eyes slowly adjusted to the dimly lit cellars. 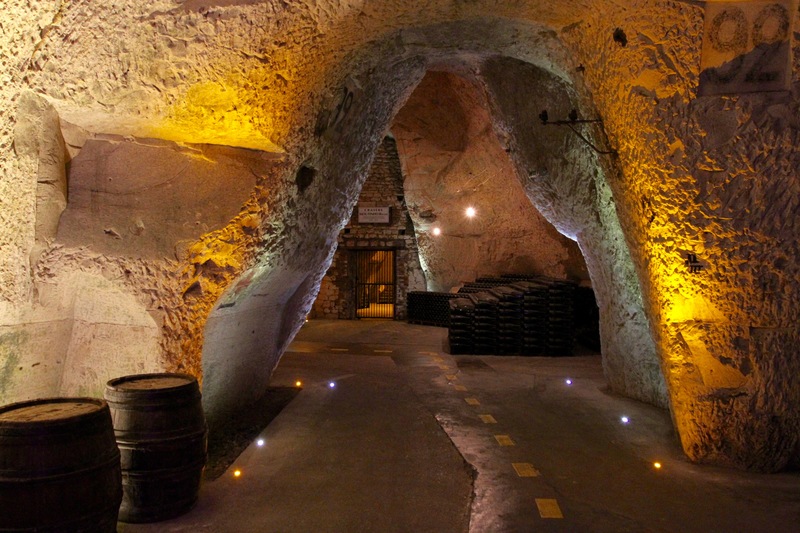 The millions of bottles of champagne in these cellars, worth billions of euros, are the main attraction, but walking these tunnels is to walk through history. 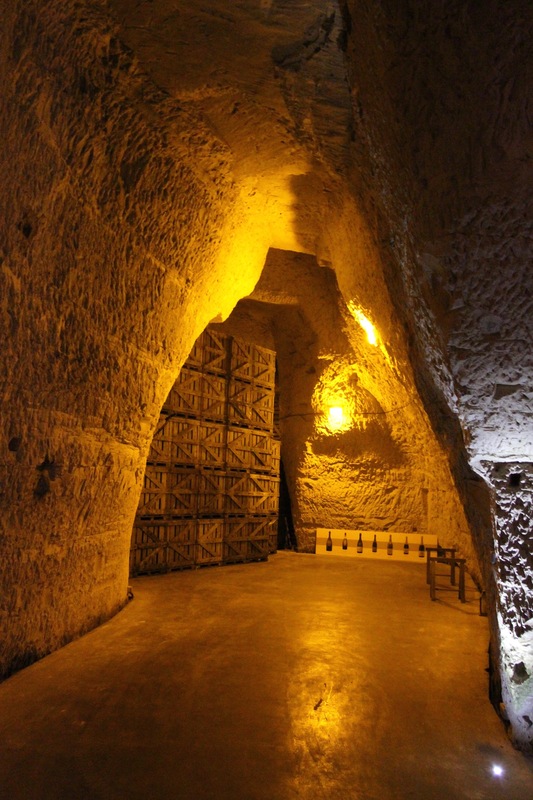 They’ve been here since the Romans mined them for chalk in 1AD. 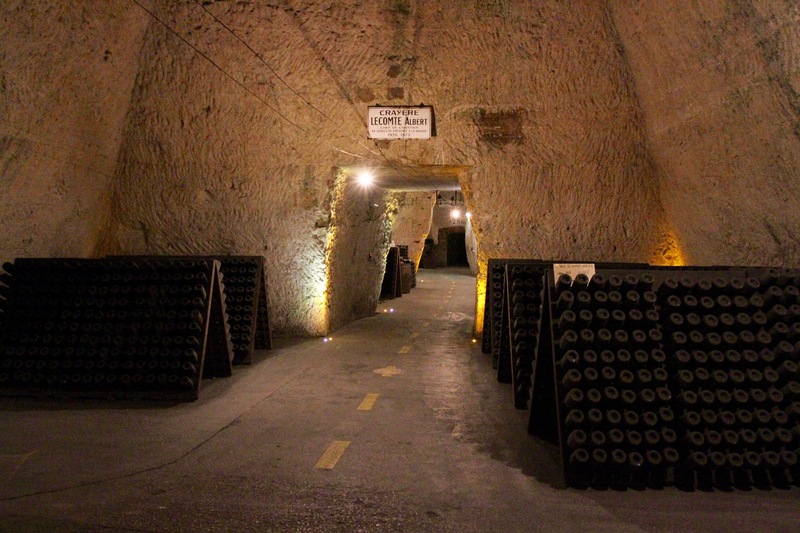 Once underground, our guide took us on an hour-long tour through the cellars and narrated the life of Madame Clicquot. 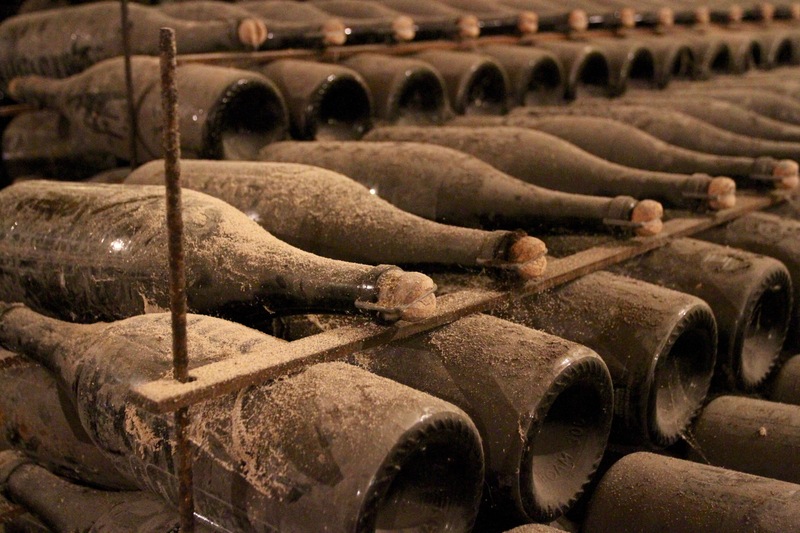 Amongst her many achievements, in 1810 she invented the first vintage champagne, a tradition that continues to this day. In 1818, she created a new way of making rosé champagne. Responding to early consumer concerns about authenticity, she invented the iconic yellow label that distinguish Veuve Clicquot from its competitors. 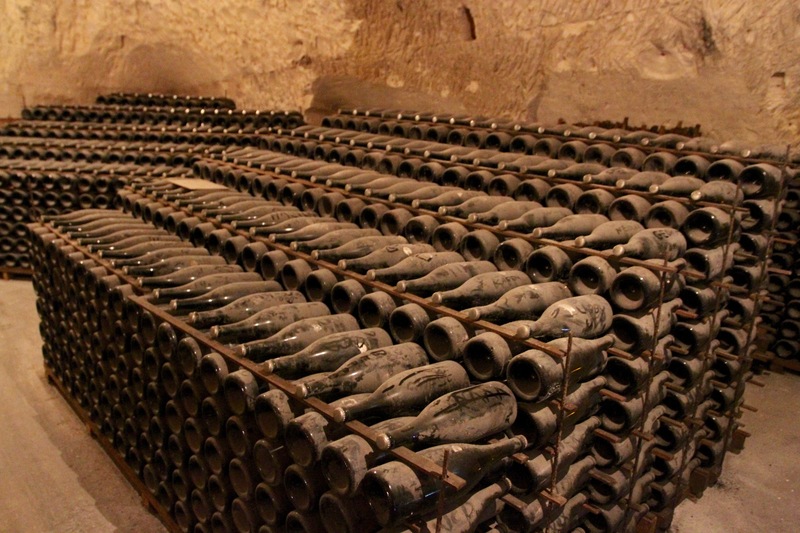 Perhaps her most significant contribution to the art of champagne production came in 1816, when she invented the riddling table. This simple but effective way of separating and expelling the yeast and other solids in a champagne bottle ensures a crystal-clear wine. 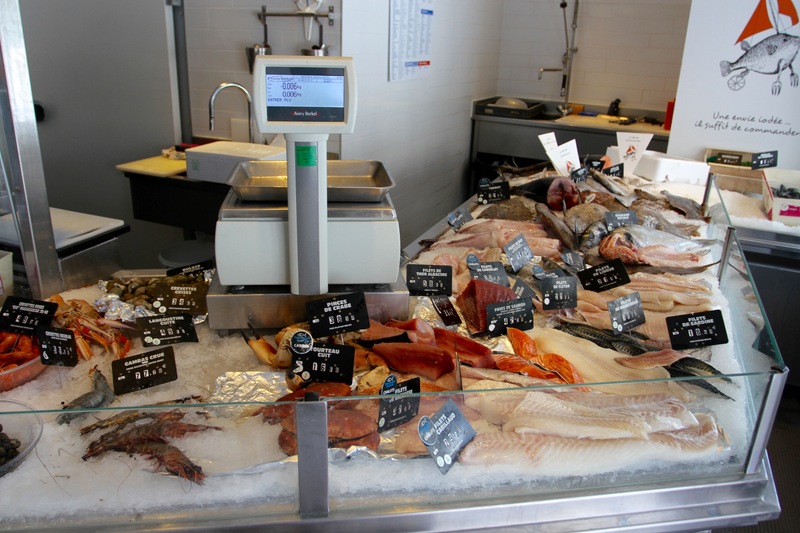 The process has been mechanised today, but is essentially the same one Madame Clicquot invented. Passing a bottle of Veuve Clicquot that had been retrieved from the bottom of the Baltic Sea two hundred years after the ship carrying it sank, we emerged back into the sunlight and warmth. We took a seat in the garden and finally got to taste La Grand Dame, a vintage created to mark the 200th anniversary of the company … there are worse ways to spend a morning in Reims. 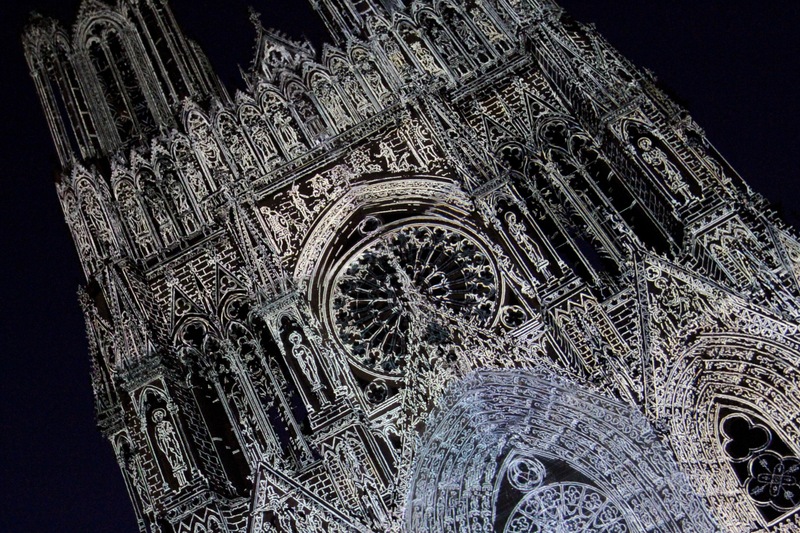 Reims is a surprising place. Famed for its links with the French monarchy, it’s crowned by an architectural gem, the truly magnificent Cathedral Notre-Dame de Reims. 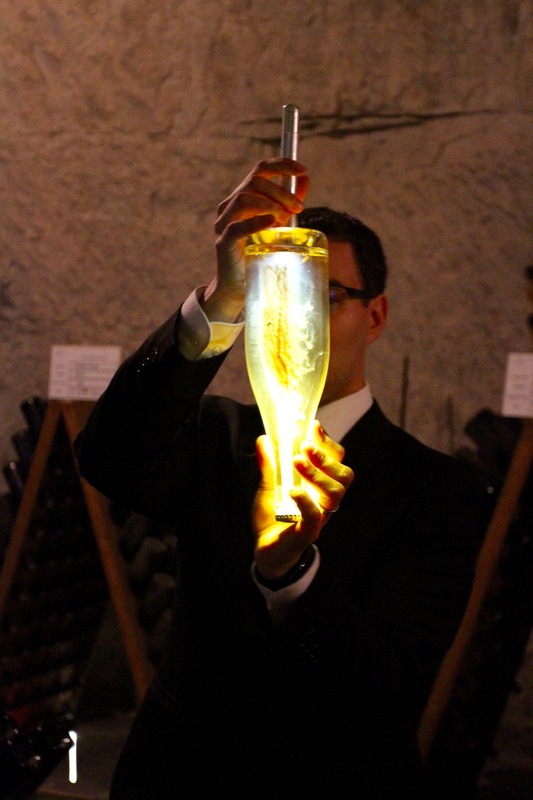 It’s home to some of the world’s most famous champagne houses and, almost beyond cliche, people are to be found sipping glasses of the fizzy stuff at all times of day and night. Thanks to a turbulent history, the town is also a remarkable hodgepodge of architectural styles that makes it unique. Walk the streets and you’ll pass medieval-looking timber framed buildings next door to 1920s art deco houses, and a myriad of architectural styles in between. At the start of the First World War in 1914, Reims was overrun by German armies. The German’s were forced to retreat from the city but set up camp on the surrounding heights, from where their artillery proceeded to flatten Reims over the next four years. The city that re-emerged over the next two decades had wide avenues and pleasant public spaces. Desperate to rebuild the city, the authorities encouraged people to build in whatever style they liked. Fabulous Art Deco and Art Nouveau buildings rose from the rubble and now make the town a hotspot for architecture enthusiasts. 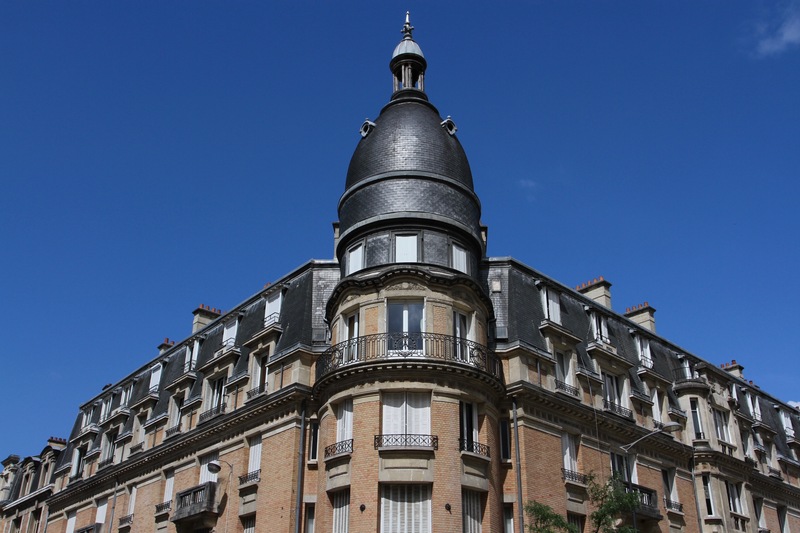 There are a remarkable number of these buildings, including gems like the Halles du Boulingrin, the indoor market, and several nearby bars and restaurants with exquisite Art Deco interiors. 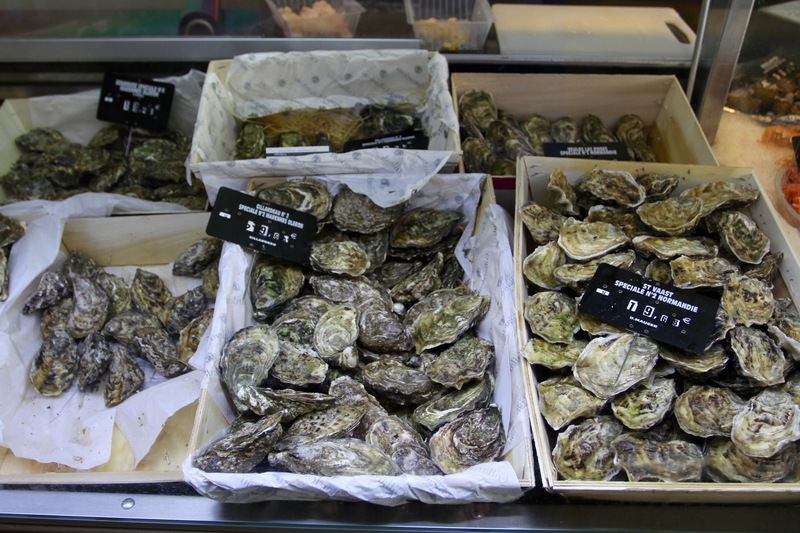 Unfortunately, Reims had the misfortune to be situated in a strategically important place (and not just because it’s at the heart of some of Champagne’s finest vineyards). The city was damaged again during World War Two, although not so seriously as in the earlier war. 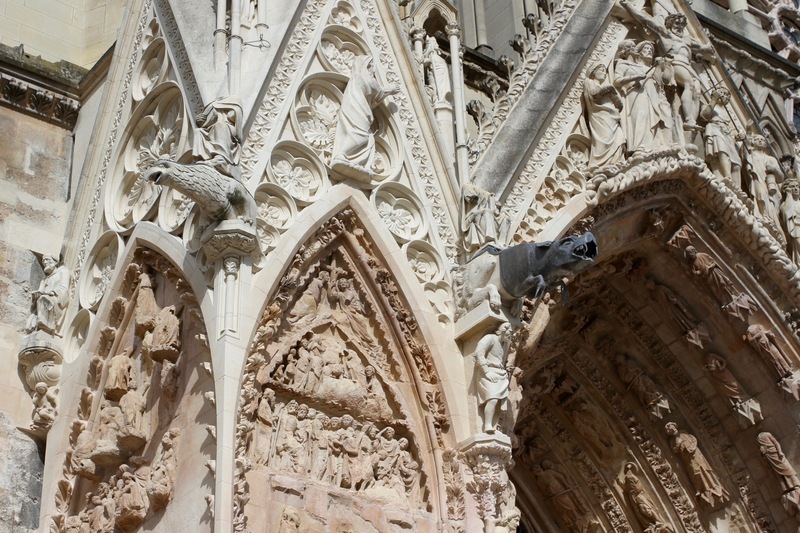 This devastating history bequeathed Reims its patchwork of architectural styles unlike anywhere I’ve visited. The city may have lost some of its history thanks to the bombs, but it more than compensates in other ways. This includes the little known (to me at least) role Reims played to bring an end to the Second World War. It was here at 2.41am on May 7, 1945, that Nazi Germany officially surrendered to the Allies. This extraordinary event took place in a fairly anonymous and nondescript school near the railway tracks a short distance from Reims central train station. General Eisenhower moved his Supreme Headquarters here in February 1945 and commanded the Allied advance on the Western Front from this building. The “little red schoolhouse” where Chief of Staff of the Wehrmacht, General Alfred Jodl, signed the unconditional surrender that brought an end to the war in Europe, is today the Musée de la Reddition. It tells the story of the surrender – largely through the use of mannequins. The introductory film was informative, but the real highlight is in the room where the surrender was signed. 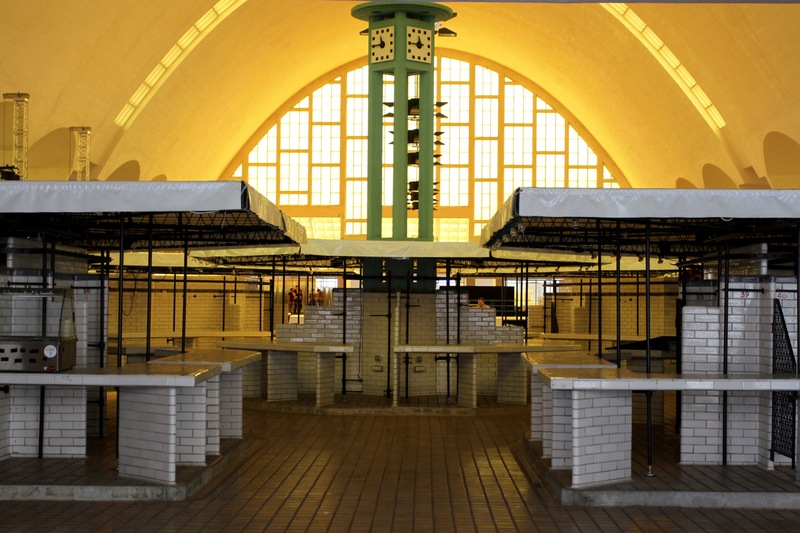 Here, the original tables and chairs are surrounded by walls covered in maps of the theatre of operations. Stalin was deeply unimpressed that the surrender was in Western Europe and didn’t officially recognise the Reims surrender. He insisted that a second ceremony was held in recently captured Berlin on the night of May 8th. Photos of the Nazi surrender in the virtually destroyed German capital are some of the most famous images from the war, and Reims’ role in bringing hostilities to an end have largely been overshadowed. 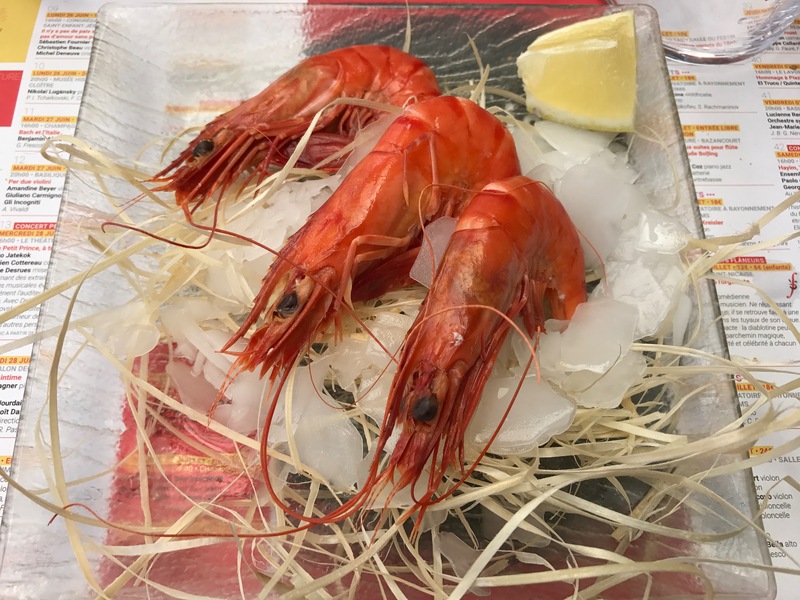 We spent a couple of days in Reims, sampling the relaxed lifestyle, sipping champagne and eating excellent food at outstanding bistros and restaurants. It’s a compact city that is easy to get around on foot. 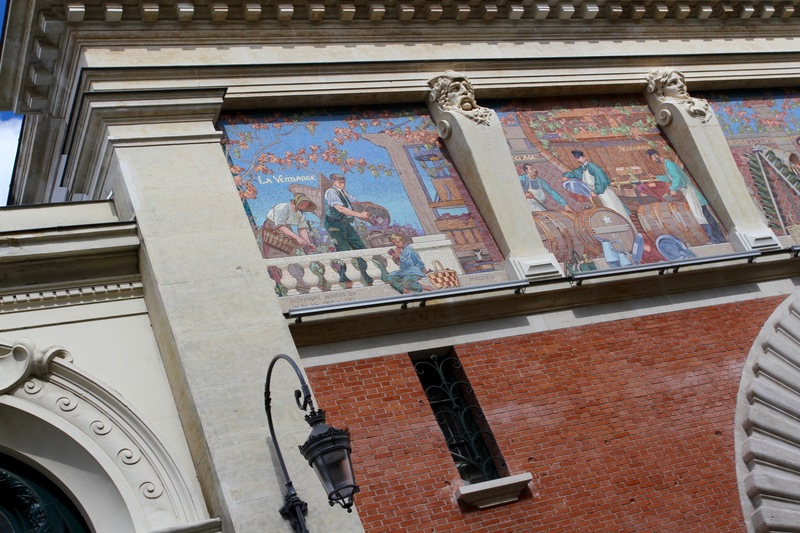 Other than the cathedral and champagne houses, the Musée de Beaux Arts is worth a visit, even when half of it is closed, as it was when we visited. The real pleasure of Reims though, is to wander the streets and hunt out the architectural legacy of its violent history.